RIYADH, May 5, (AFP): Saudi Arabia on Thursday put to death a Jordanian convicted of drug trafficking, in the kingdom’s 91st execution this year. Maher Al-Ghurabli had been found guilty of smuggling amphetamine pills into the kingdom, the interior ministry said in a statement. Authorities carried out the sentence against him in the northwestern region of Tabuk, which borders his Jordanian homeland. Most people put to death in Saudi Arabia are beheaded with a sword. Ghurabli’s is the 91st execution of a local or foreigner this year, according to an AFP tally. The executions include 47 for “terrorism” on a single day, Jan 2. 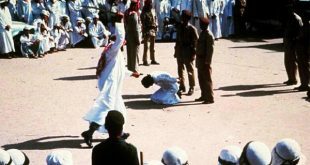 Murder and drug trafficking cases account for the majority of Saudi executions. Amnesty International said Saudi Arabia had the third highest number of people put to death last year — at least 158. That was far behind Pakistan, which executed 326, and Saudi Arabia’s regional rival Iran, which executed at least 977, said Amnesty, whose figures exclude secretive China.